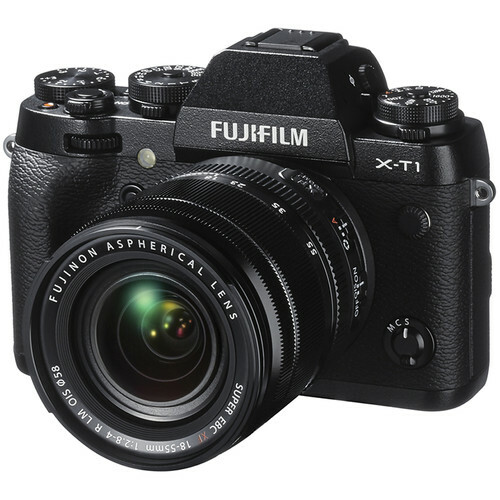 The Fujifilm X-T1 Mirrorless Digital Camerafeatures a 16.3 megapixel APS-C X-Trans CMOS II sensor and an EXR Processor II to produce high-resolution imagery with an expandable sensitivity range from ISO 100-51200 as well as a top continuous shooting rate of 8 fps. Fujifilm's proprietary X-Trans sensor uses a unique randomized pixel array in order to avoid the use of a resolution-reducing optical low-pass filter, therefore providing images with the utmost sharpness and clarity. This imaging system is benefitted by the Intelligent Hybrid AF system, which uses both contrast- and phase-detection methods to acquire focus quickly and accurately. Enhanced manual focusing capabilities are also a result of these technologies; Digital Split Image and Focus Highlight Peaking are two methods for quickly and precisely determining focus using intelligent focusing aids for improved control and optimized efficiency. Aside from benefitting low-light performance, the EXR Processor II also provides quick performance throughout the entire camera system. The camera start-up time is about 0.5 seconds, shutter lag is about 0.05 seconds, and the shooting interval time is about 0.5 seconds. A fast autofocus performance speed of 0.08 seconds is also enabled using the advanced Intelligent Hybrid AF system using both contrast- and phase-detection focusing methods. An advanced electronic viewfinder has been incorporated into the X-T1's design to support clear eye-level monitoring along with a host of unique viewing features to better support a more efficient overall workflow. The Real Time Viewfinder is comprised of a 2,360k-dot OLED display and features an exceptionally high magnification of 0.77x, along with a 31° angle of view. This perspective is further complemented by the 0.005 sec. lag time, which smoothly and seamlessly renders scenes and moving subjects. Taking advantage of Fujifilm's vast history in traditional film-based photography, the X-T1 integrates several Film Simulation modes to mimic the look and feel of some Fujifilm's classic film types. Pulling from their line of transparency films, PROVIA offers natural-looking tones for everyday shooting, VELVIA produces a more dramatic and rich tonality with deeper color saturation, and ASTIA gives less contrast for a softer depiction of skin tones. Mimicking their negative films, PRO Neg. Std. gives smooth image tones that are suitable for accurate color renditions, while PRO Neg. Hi produces a more dramatic feel with the ability to draw color out of a variety of lighting conditions. In addition to the colorful benefits of these Film Simulation modes, there are also monochrome modes that simulate the look of traditional yellow, green, and red black and white contrast filters. A sepia mode is also available for producing an inherently nostalgic look. The included XF 18-55mm f/2.8-4 R LM OIS lens provides a 35mm-equivalent focal length range of 27-84mm, covering wide-angle to portrait-length perspectives to suit working with most everyday subject matter. An optical image stabilization system counters the appearance of camera shake by up to four shutter speed steps and a linear-driven autofocus motor helps to produce quick and smooth focusing performance. Three aspherical elements and one extra-low dispersion element work to minimize chromatic aberrations throughout the zoom range while also benefitting overall image clarity and sharpness. A Super EBC coating has also been applied to individual elements to reduce lens flare and ghosting for a enhanced contrast and neutral colors.